Okay, relax. Hockey’s easy. Talk about how disappointed you are that the Caps haven’t put their offense all together yet. If they grill you, citing a few blowouts, ask about where Ovechkin’s mojo is. They might get defensive, yes, but you can say that you’re still happy with the top of the Southeast with last night’s overtime win. You’ll be fine. I promise. 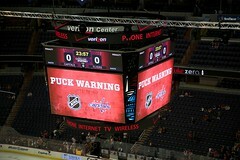 And get out to Verizon Center, that’s a pretty fun and fan-friendly atmosphere. I know we’re taking you out of your comfort zone to talk about basketball, but we’ve got a few things to mark off the list here. Gush about John Wall. The kid’s amazing. He just missed a triple-double (that’s double-digit totals in Assists, Points and Steals) against Philly last week, so figure that will come up. The Wizards need to run the floor better, and they’re still adapting to the return of Gilbert Arenas. They’ve got a long long way to go before they’re good again. They’re going to want to talk about Grossman/McNabb, and it doesn’t matter if you pick one direction or the other, because no one really seems to be focusing on merits at all. Embrace it.